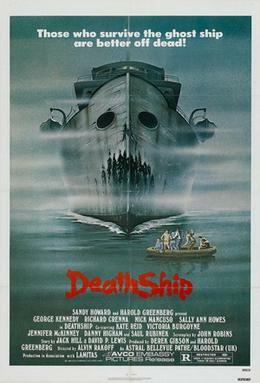 Death Ship is a disaster movie, and a horror film (and some would maybe insert the words “of a” between “disaster” and “movie”). In our books, this one’s super-fun and we thought it’d make excellent podcast fodder solely because of the poster and the cast. The freighter alters course, and starts to bear down on the liner, interrupting one of those captain’s dinner / passenger shindigs. Despite actions so evasive you’d think Hillary Clinton or Donald Trump were behind them, the two vessels collide!! The next day, there’s a dinghy floating about in the open ocean, and it includes a waterlogged captain, his first mate (played by the Colonel Troutman dude from Rambo) and some surviving passengers and the dude who was a love interest on the hit TV series, Fraser. Soon, the stranded survivors drift into the mysterious ship, which has a boarding ladder hanging into the water. They hop aboard, thinking they’re saved, but that could not be further from the truth. You see, the ship’s been totally abandoned and is just drifting around as if it’s been possessed by some nefarious spirit. Spoiler alert: It friggin’ has. Jeez, the Golden Era of horror, roughly speaking, was so much bloody fun. And even though Death Ship is as far removed from the likes of Friday the 13th or Halloween as you can get, it still manages to succeed because like those films, there’s a solid understanding that place matters. And this ship provides so much incredible atmosphere. Is Death Ship (1980) a classic for the ages? Undoubtedly not, but it’s a warm blanket of nostalgia amidst choppy seas. Join us and subscribe to the Really Awful Movies Podcast, a podcast about movies which aren’t really awful at all (despite what critics often tell us).